This study aimed to explore the influence of remote ischemic conditioning (RIC) on radial artery occlusion (RAO) and distinguish the risk factors for RAO. A total of 640 consecutive patients who prospectively underwent transradial artery coronary angiography (TRACA) (322 patients received RIC before TRACA) were enrolled. RIC was not performed in 318 patients. RAO was estimated using Doppler ultrasonography after the procedure. Patients were divided into two groups according to the protocol of RIC: RIC and non-RIC. The rate of RAO was significantly lower in the RIC group than in the non-RIC group. Patients were divided into two groups according to the patency of radial artery: radial artery patency (RAP) and RAO. The radial artery diameter was significantly narrower in the RAO group (2.31 ± 0.53) than in the RAP group (2.59 ± 0.47). The rate of applying β-blocker was significantly higher in the RAP group (69%) than in the RAO group (41%). The rate of applying trimetazidine was significantly higher in the RAP group (49.1%) than in the RAO group (17.6%). 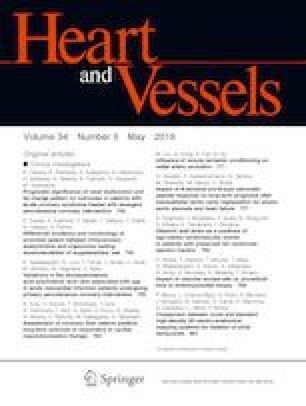 The multiple logistic regression analysis using radial artery diameter, RIC, β-blocker, and trimetazidine treatments revealed that small radial artery diameter, lack of β-blockers, and RIC were independent predictors of RAO. RIC might help in improving the rate of RAO. The multiple logistic regression analysis showed that the lack of β-blockers, RIC, and small radial artery diameter were independent predictors of RAO. All the authors have no funding, financial relationships, or conflicts of interest to disclose.